Oh, boy. I honestly never thought this would happen. Together at the table. At the Global Table. 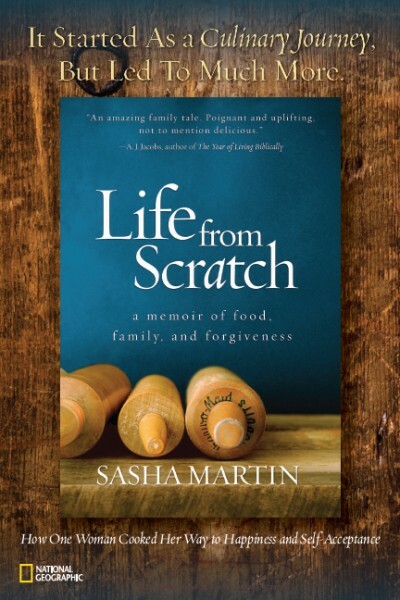 When I decided to cook a meal for every country in the world, I had visions of exotic spices laced throughout grand feasts of epic proportions. I imagined a variety of fresh herbs, carefully plucked from a garden somewhere. Canned corned beef, never really popped up in these daydreams. But, when Soraya the Samoan suggested I try Palusami, I quickly learned the time had come to eat canned shaped meat. I sidestepped this challenge for as long as I could but throughout Polynesia, canned corned beef is a fact. A much loved staple. I could have cooked it for Fiji, or Nauru, or Kiribati, or Palau, and on and on. But I didn’t. Some of you even egged me on. But I just couldn’t face it. Until now. Until Samoa. 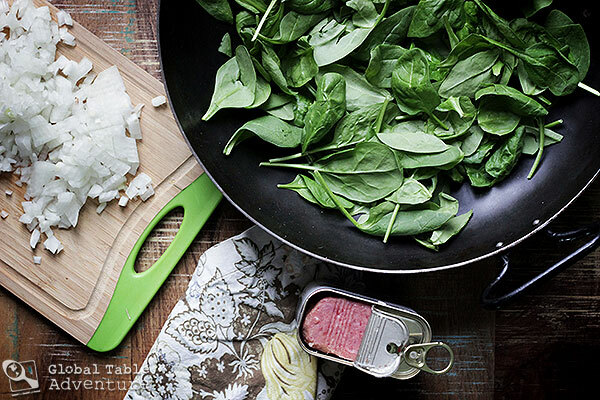 Today we finally cracked open a can for their version of creamed spinach called Palusami. The irony is, of course, that the recipe is just as traditional without the corned beef (and is completely vegan), but making the dish with the optional corned beef was more about me challenging myself. And I’m so. glad. I. did. No, really. 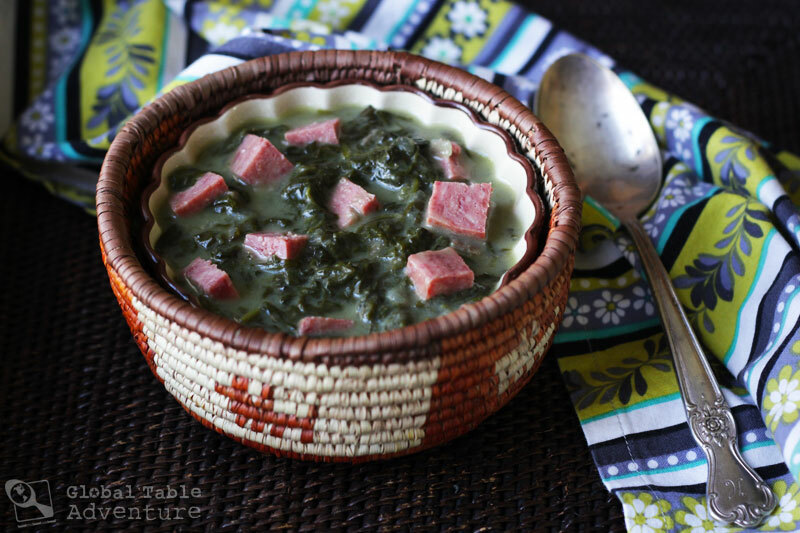 This dish tastes like coconut creamed spinach with a nice salty kick from the meat. It makes a great dip or side dish and a total conversation starter. Oh, right. The Samoans. And the entire Polynesian community. P.S. 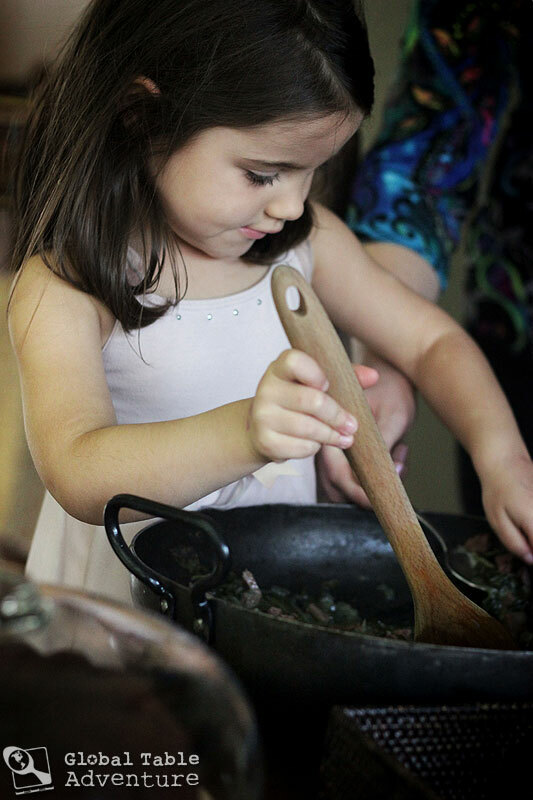 In Samoa, corned beef is called pisupo – which is just means canned food. P.P.S. The dish is traditionally made with young taro leaves and coconut cream wrapped in older taro leaves (the end result looking like a little pouch), which is then baked in an underground oven called an imu, but Samoans who have immigrated to the USA have assured me that spinach makes a fine substitute and a casserole is great if you can’t get the right leaves. As for the coconut cream, you can make this by shaving coconut flesh to produce the thick mixture, if you have time on your hands otherwise canned coconut milk (full fat please) tastes great. Preheat the oven to 350F. 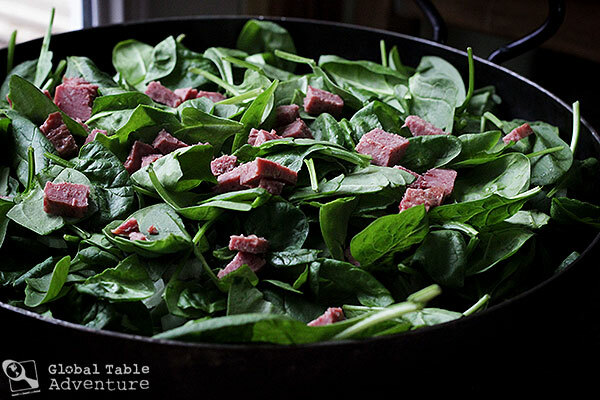 Layer everything in a 13×9 casserole, or a giant ovenproof pot as I’ve done, alternating between spinach, onion, and cubed corned beef. You might need to really pack it in, depending on the size of your vessel. Top everything with a can of coconut milk, cover tightly, and bake for about 55 minutes. Meanwhile, write a love letter and seal it with a kiss and a spray of perfume. The world will be a happier place. When the Palusami comes out of the oven, give it a good stir… taste… and if it needs more salt or maybe pepper, go for it! Enjoy with taro, rice, or potatoes. Each bite will be coconut-creamy, a little salty, and all kinds of good. Even the cat wants some. 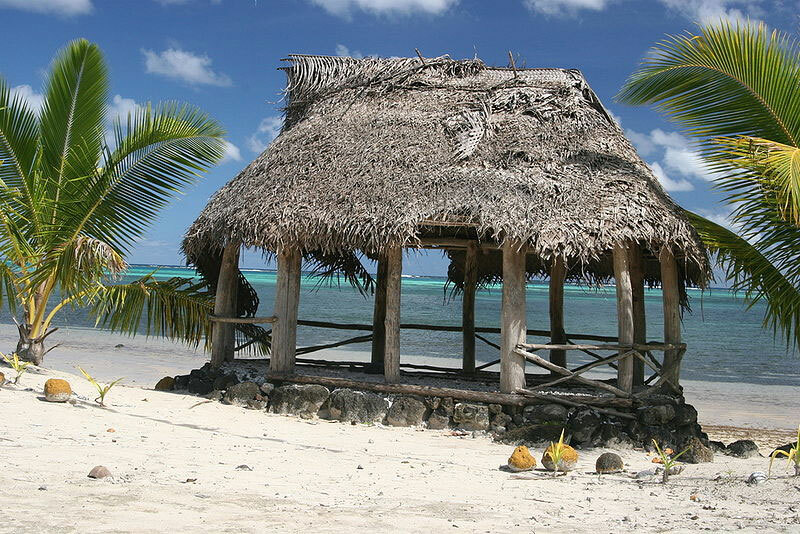 Samoan Fale. Photo by Sonja Pieper. I’m so glad I tried this Samoan staple… and didn’t let my fear of canned meat get the best of me. So what about you? Do you eat canned meat? In Samoa, corned beef is called pisupo – which is just means canned food. The dish is traditionally made with young taro leaves and coconut cream wrapped in older taro leaves (the end result looking like a little pouch), which is then baked in an underground oven called an imu, but Samoans who have immigrated to the USA have assured me that spinach makes a fine substitute and a casserole is great if you can’t get the right leaves. As for the coconut cream, you can make this by shaving coconut flesh to produce the thick mixture, if you have time on your hands otherwise canned coconut milk (full fat please) tastes great. Coconut Milk is not the same as Coconut Creme….One is the liquid from inside of the Coconut. The creme is made from the pulp by scraping and scraping and this produces a thick white mass called Coconut Creme which has a distinct flavor and consistency. 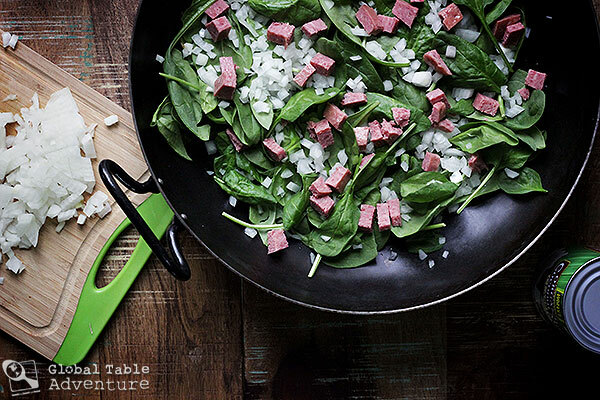 Your spinach recipe is not thick enough and because you used the milk instead of the actual creme, my bet is it also tastes weak and needs salt. Can’t remember having criticized any of your recipes before…. It had to happen sooner or later… haha. In all seriousness, this recipe was recommended to me by a local as a decent approximation of a traditional method… clearly not the same though. I will say, the meat does add plenty of salt for me although others might want even more. Actually, the liquid that is naturally inside the coconut when you open it is coconut water and it is very thin. Coconut milk is coconut flesh that has been steeped in water then drained to create a new liquid. And coconut cream is reduced coconut milk (and can been sweetened if it’s going to be used in cocktails). The result was a somewhat fluffy thick substance which was often placed inside taro leaves and then banana leaves and cooked over coals. That sounds right and would explain how it could be wrapped in the taro leaves which in my mind would look like wrapped uncooked lau-lau. I was wondering how you would be able to wrap coconut milk as I imagine would be thin and runny. I saw this done in American Samoa and cooked in the umu. The coconut cream is literally squeezed out of the meat by hand after it is grated. They use a net made of banana fiber. 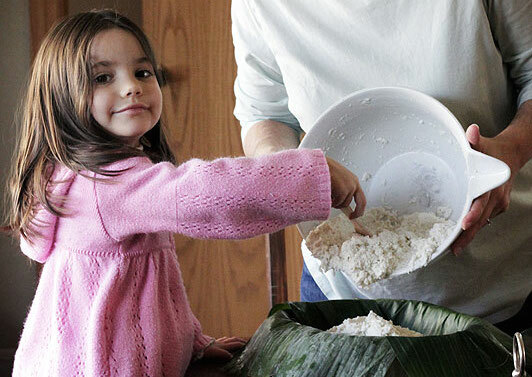 The taro leaves are layers and layers so that you create a cone to put the coconut mixture in. Then it is wrapped in either tougher leaves or foil before being placed on the hot rocks of the umu and covered with banana leaves to cook. It is unbelievable delicious! Don’t use coconut milk – much too runny. It should set a bit. Coconut creme is made by squeezing the milk out of the finely scraped coconut meat. Coconut milk and coconut creme are one and the same. That liquid inside the coconut is coconut water or coconut juice. It makes a wonderful drink when the coconut is about half mature, and the meat can be removed with a spoon. BTW, some refer to coconut creme as coconut milk when it is thinned with water or the juice of the coconut. I heard an interview with Martha Stewart, and she admitted that she loved Spam AND Velveeta, so you’re in good company with a wide-ranging palate. Canned meat…its a guilty pleasure. One that is not commonly spoken about in public! If you find your dish a little weak I did find canned (unsweetened) coconut creme at Trader Joe’s the last time I was there. On the can it suggests it be used when a thicker, richer product is called for. I used it in a Thai curry instead of coconut milk and it was delicious. I thought Spam was spiced ham? A different product entirely from corned beef…. Wait… what? There’s different kinds of canned meat product?! I had no idea! Off to educate myself on this.. it’s like a whole new world has opened up to me haha. I brought some cans of corned beef with me when I visited a remote and barely contacted tribe in central New Guinea. After we ate it, they thought the can itself was so beautiful that they mounted it on a pole. And here’s a Samoan lullaby. Oh and here’s something interesting from the Cook Islands, put here because Samoa is their closest neighbor. They are pretty much an independent country though I think N.Z. handles their foreign affairs. It is remote enough that some old residents remember the old sailor’s songs, chanties, from around 1850, the days of sailing ships. Here is one such resident singing them, recorded in 1982. Never thought I’d be asked to comment on my spam experience! but I do have two personal stories to share. Growing up on an Iowa farm in the 50’s & 60’s, I was spoiled with beef, pork or chicken that we raised, butchered and stored in a huge chest freezer. 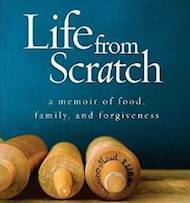 but there were some nights when my mother deferred to the lazy Susan cupboard for canned fish or meats – including Spam – when the dinner meat (that’s what a hearty noon meal is called on a farm) woudnt stretch enough to feed all 7 of us again as leftovers for supper. and if mother was working outdoors too late to make her homemade soups (no casseroles or pizza in her kitchen) then she we fry thin slices of Spam to accompany her waffles or Norwegian crepes called Egge Kage. the second memory I can be more brief in describing! when we lived in Fuzhou, China for a year with our two young sons, we pretended fried Spam was bacon or ham, as neither were available to buy…Makes me want to try it again! This looks like an awesome recipe.. Just a few corrections. Pisupo – Canned corned beef, not meat. 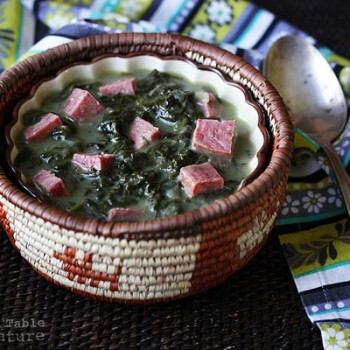 Imu – Hawaiian umu – Samoan, and traditionally we do not put corned beef in our palusami, the Tongans use pisupo in their dish called lu sipi (which is technically palusmi with corned beef). Otherwise, I love your food blog. Keep up the great work! I would use a different canned corn beef …the brand most samoans like is Palm brand corn beef!!! 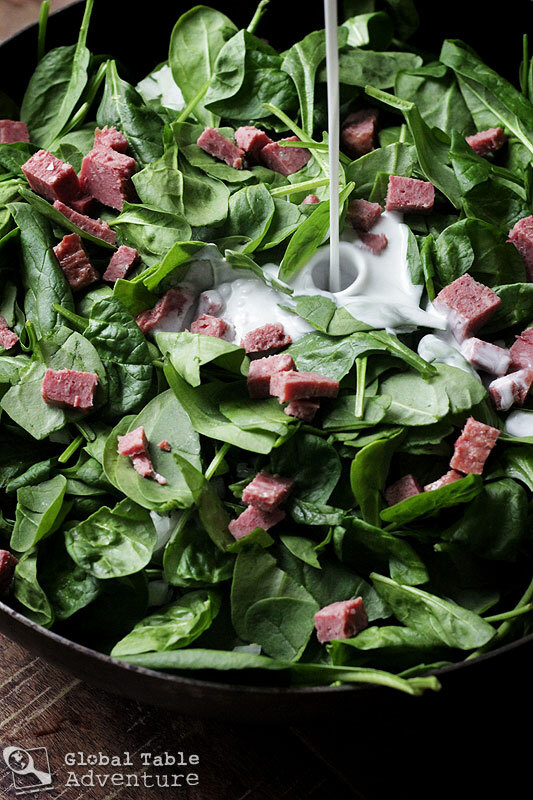 Palm brand corned beef is meaty with just the right amount of fat. 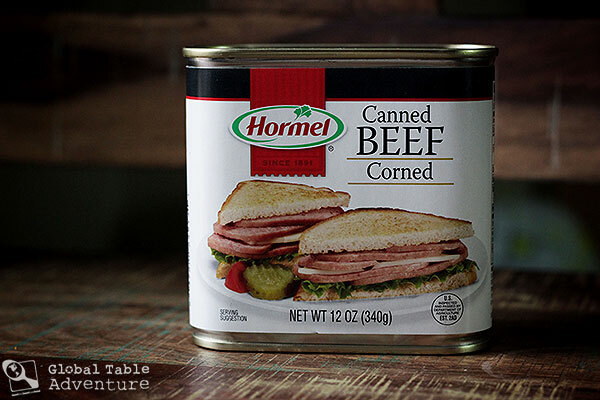 To me, it is the best tasting of all canned corned beef, and I’ve tried most, if not, all of them. I love to see people try palusami because it looks unappetizing, but is so delicious. Though, as a side note, Samoans cook in an above ground oven called an umu. The imu is a pit dug in the ground traditionally used by Hawaiians.